what signal can I use to close the current editor of a QAbstractItemView derived class when I click somewhere else on the ui. Of course I can connect a signal from every Widget if it is clicked to the closeEditorSlot, but there must be a better way? Actually thats normal behavior you trying to achieve. When the editor widget receives focus and then an focus out the editor is closed. Unless you have some custom composed editor or some other special properties set? 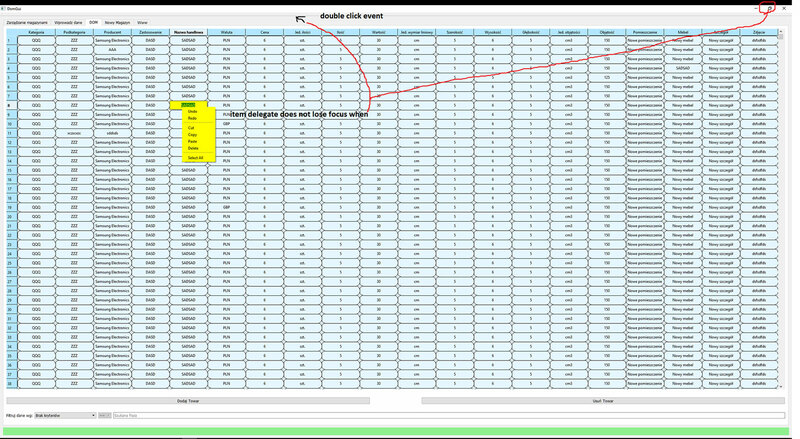 It is a QTreeView, that has a QStyledItemDelegate in it which may be a QLineEdit for example. Now when I start editing the cursor appears in the QLineEditDelegate and I can edit it. However when I'm done editing I have to confirm it by pressig enter or clicking somewhere else in the QTreeView. Clicking some other Widget in the UI or somwhere else on the mainwindow does not close the editor. Maybe I have some Signal/Slot connection with the Delegate missing? Is it a custom QStyledItemDelegate ? There should be nothing to code at all to obtain the behaviour you describe. Can you show us your delegate's code? Are you subclassing the view as well? @SGais, yes it is a custom delegate. and i guess it isn't working for editors which are created with a lineedit and checkbox? As i said when the editor widget (the pointer returned from createEditor()) receives a focus-out event the editor is closed. Since you compose a editor widget the sub-widget receives the focus-out event without the QStyledItemDelegate recognizing it. So you need to make sure that the container widget receives a focus-out event or to close the editor yourself. I have checked it and it looks like when you edit a ItemDelegate in some cell of in my case the tableView and after you move the mouse arrow to QMainWindow and you clicked once or double then looks like the itemDelegate in the cell does not lose its focus even you resize the main widow. It loses its focus when you click on other widget located on the gui of QMainWindow. To your second Question: I'm doing this since I want to add some more features to the Delegate like QSpinBoxes later depending on the type of data a item stores. @VRonin: what I need at the end is depending on the Item: QSpinbox or QComboBox or QLineEdit (and maybe some more like a QCombobox besides the QLineEdit in a single cell) depending on the data type the item stores. Can this all be done with the QItemEditorFactory? Then I'll take a look at it. EDIT2: so there seems to be some other thing going on. The QTreeView is in a Dockwidget and when I place some pushbutton inside the QDockWidgetContente besides the QTreeView and I press it the editor is closed as it should. However when I click some pushbutton on the MainWindow it is not closed. Ok i found out that the problem is somwhere totally else and has nothing to do with the Delegate or the DockWidgets. All my buttons are QToolButtons. When they are clicked the editor does not close. clicking the second one closes the editor in the view. However closing the first one does not. Even more it does not have to do with the view at all. Just a Mainwindow with a QToolButton a QLineEdit and a QPushbutton will demonstrate the behavior. Thanks a lot. That solves the problem.